Calla lilies (Zantedeschia elliottiana) are African native plants that grow from rhizomes. Not true lilies, callas bear funnel-shaped flowers in the summer. They grow to 24 to 36 inches tall, and are popular cut flowers. Callas are hardy to U.S. Department of Agriculture Zones 8 through 11, grow in almost any type of soil and are quite easy to care for. 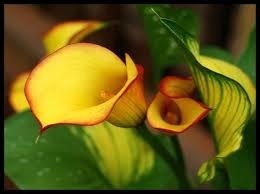 All parts of the calla lily are toxic if ingested. Plant the calla lily rhizomes 1 inch deep into the soil. When planting more than one, space the rhizomes 12 inches apart. Water the rhizomes immediately after planting and keep the soil moist at all times. Do not allow the soil to either dry out or get soggy as both conditions are intolerable to the calla lily. Apply a 10-10-10 fertilizer every two weeks during the growing period, at the rate specified on the fertilizer label. Water after fertilizing. 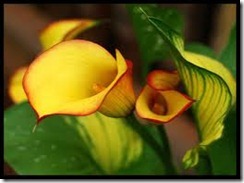 Encourage the calla lily to go dormant by withholding water when the leaves begin to yellow and die back in the fall. Remove the calla rhizome from the soil before the first frost, unless you live in zone 8 or above. Zone 8 gardeners who receive frost can allow the rhizome to overwinter in the garden, covered with 5 inches of mulch. Allow the rhizome to sit, out of direct sun, for three days or until it is completely dry. Brush the soil from the rhizome and cut off the foliage. Bury the rhizome in sawdust in a box and place it in an area where the temperature will remain between 50 and 55 degrees Fahrenheit. Plant the rhizome in the garden the following spring.